You have decided to volunteer at a military hospital that is short on hands. Due to medical inexperience, you're just tasked to help get supplies to where they need, help the nurses with simple duties, and make sure that the soldiers are fed and well. It's during a volunteer hour a group of soldiers (opposite of either side you are currently on in the Kou War; if neutral, decide which faction the soldiers are) attack the hospital. Defend the staff and already wounded soldiers from harm by defeating the soldiers. Description: The officer of the group of soldiers is dressed in fine armor typical of a samurai, with the symbol of the faction he supports on his armor. He wields a katana that deals B-tier damage. ♦Deathly Strike: The officer steps forwards and gracefully slashes their sword, hitting their opponent with the calculated attack. Deathly Strike deals A-tier damage. ♦Twin Swallow Strike: The officer lunges forwards, and in two fluid motions, he slices the opponent twice with his sword. Each slice deals C-tier damage for a combined total of B-tier. Description: Soldiers dressed in simple armor expected of a soldier. On their armor, they have the symbol of the faction they support. The soldiers wield cheap iron swords. ♦Charge! : The soldier rushes forwards, yelling a battle cry as he wields his sword in the air. Once he comes close enough, the soldier lunges at his opponent and swings the blade down, dealing C-tier damage. ♦Lunge Attack: The soldier lunges forwards and thrusts his sword forwards, stabbing their opponent and dealing C-tier damage. They said to know more about your enemy, you should start from the inner circle. So here the redhead stood, in front of this information board inside this tavern. There was some kind of volunteer needed at the military hospital, perhaps to help them with some simple duties that the experts couldn’t deal with due to the total patients that they need to tend. Altan knew several medications things that was related to herbs or natural medicine although that maybe not really enough for her to really help in medical field. 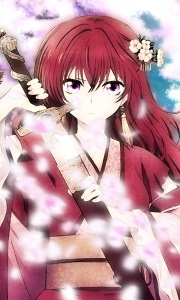 However the redhead though that she might be able to get some kind of information about the emperor as well as doing a good deed at the same time by helping some injured people. Altan headed to the military hospital and sighed at the scene that she was looking at, it seemed that she might not get the time to gather some information after all. Soldiers sat down, some were laying down on the ground while enduring the injuries that they got. Not only that, Altan could see some civilians among the injured patients and the medic was overwhelmed with the number of the people that they need to treat. The redhead wondered if she could really help but decided to just go ahead and offered her assistance as a volunteer. For the swordsman, the path that he chose didn’t require anyone else to stay beside him, either in romantic way or even as an comrade. It was a path for a lone wolf, for a man who decided to drop everything he had and for a warrior… who never really put his trust to the other to watch his back. It might sound harsh but he never really put any care to other people unless he felt the need to do it, although it was a little different after he found his sister. His sister would be the only person that could see the real him, the only person left in the world that would make the swordsman be himself. However here he was, summoned towards the clinic by one of the surviving soldiers because there was this heavily injured soldier who wanted Tenma’s company in his last moment. 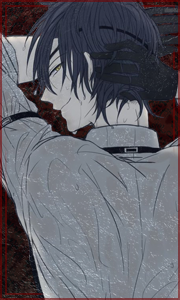 The black haired man scratched his head, wondering who might be the one that need to be comforted by him. The moment Tenma arrived at one of the wards, there was a lot of injured people, mostly soldiers but he could find out right away about who summoned him. “Tao?" Tenma called the general who was closing his eyes, trying to breathe steadily although his wound was pretty visible and although bandage was wrapping around him, blood still pouring down from his injury. Opening his eyes weakly, Tao saw the man he wanted to see in his dying moment and began to whisper, “You came. How do I look now?” A small laugh came from his chapped pale lips, but a cough followed after. Not long after that, the door to the room was suddenly open and a red haired female entered inside while holding a box of bandages. The swordsman tilted his head to the woman, noticed that she was quite confused because there was only one person beside all this patients sitting next to a dead man. The redhead opened the door towards the appointed room quickly, wanting to do her job as efficient as she could. However it seemed that she had entered in a wrong timing, she didn’t notice that someone was inside nor that she noticed their voice from the outside. It was awkward and she couldn’t help but to look towards the only man who was sitting on the chair, seemed to comforting the injured man who was laying down on the medic bed beside him. Her eyes wondered to the other patients, observing them before focusing back on the sitting man and his wounded comrade, noticing the latter has a different color skin and no sign of movement on his chest. It became more awkward for her and her face looked confused as she tried hard to think of what to do in this kind of situation. “Uhh umm…. I am sorry.” She could feel the man piercing her with a cold and sharp gaze although his lips formed a smile, so she looked away from the golden orb, staring at her bandage. It felt so intimidating but it didn’t feel like the man was angry with her nor annoyed with her presence, it was just like a strong vibe coming from the man himself and overpowered Altan’s. “They instructed me to deliver this bandage, so ummm…. Where do I put this?” The redhead inhaled some air to fill her lungs before she maneuvered her legs to move towards the one eyed man, didn’t want to be rude by speaking from far as well as to not interrupt the other resting patients. It was her first time to be overwhelmed like this, the man felt dangerous but she wasn’t sure why she could feel like that. Altan hoped that nothing bad will happen though…. The black haired man beamed a bright smile towards the redhead before shaking his head, "It is fine, I think you can put it on the shelf over there." He said as he pointed at the shelf that he mentioned before standing up and locked his one eye towards the Fanalis' eyes. It was a little bit rare for Tenma to meet a Fanalis in Kou or even interacting with one, but he guessed that maybe it was easier now in Yoshiro's era because of the slavery system removal. He was quiet happy to see one as lovely as the one standing in front of him at the moment, but his gaze didnt bear any kind of bad intention or even to underestimate the redhead. "Do you just sign up for volunteering today? I never see you on any other day before." He would then walk towards the Fanalis, intending to help her. "My name is Tenma, Mikazuki Tenma. Nice to meet you." Altan would nod and was just going to do what the man said to put the box on the shelf that the man pointed for her, but suddenly the man stood up and walked towards her, so the redhead wasnt sure if she should just wait for the man to approach her or if she should just put the box first. She was glad when the man started talking because if not, it would be very awkward and Altan was not good with that. "Yes, I just signed up. I thought it would be helpful and I also dont have anything to do." The man introduced himself but he didn't put his hand out to shake Altan's hand, instead, he did a gesture where he put his hand on his chest and bowed his head a little bit. The Fanalis thought it was pretty interesting to see it like that and she preferred it that way actually, so she bowed a little to the man and introduced herself as well. "My name is Altan. It is a pleasure to meet you as well." She didnt mention her own last name for safety reason, she would be in a trouble if the man noticed the clan that she came from and the worst could happen too. The redhead would then bring the box to the shelf that Tenma pointed before placing it there and would focus her gaze towards Tenma again. "Are you a soldier? Or perhaps a volunteer as well?" Her eyes would notice the Katana that was hanging on the man's waist, couldnt help but to think that it was a fine Katana although she didnt know for sure if it really was a fine Katana. Suddenly, Altan heard a ruckus from the outside. It seemed that several horses had arrived and a second after that, there was loud sound coming from the outside like table's banging and some medical stuffs being thrown to the ground. She was in a high alert and she quickly take her bow, wondering what was happening at that moment. The red haired lady was a polite one it seemed and Tenma praised mentally about how she reacted to his gesture as he listened to her introduction. With a smile, the black haired complimented her name, already taken a liking to it, “That is a beautiful name, it means gold isn’t it?” Tenma would clear his throat, noticing how he was overly excited about her name and thought it might make her uncomfortable before chuckling and nodded to Altan’s question. “Perhaps both? But I think I am more into the volunteer side though.” Her gaze seemed to be directed towards his Katana and the black haired man could tell that she was having a positive thought about it. “Do you think it is a good Katana?” The one eyed man was very proud of his Katana and would be happier if the girl agreed that it was indeed a good one. Tenma rushed outside as he held his bow, ready to shoot anytime when he found the enemy as he kept marching towards the chaos. He noticed several soldier with a different armor that had a different symbol and would shoot an arrow towards one of the soldier, to deal a basic damage. The arrow pierced right through one of the soldier’s shoulder but perhaps it took more than that to bring him down as he simply took out the arrow and ran towards Tenma. After he managed to get their attention, Tenma would sling the bow and arrow before he walked towards the approaching soldiers. One of the soldier charged towards Tenma as he yelled a battle cry to encourage himself. The swordsman would take out his sword and parried the attack before sending 2 front kicks right at the soldier’s abdomen. The other soldiers seemed angered and attempted to lunged his sword towards Tenma. Requirements/Drawbacks: Tenma must see the attack coming and have his weapon unsheathed. Description: The user is able to redirect up to C-tier attack with their weapon, cannot parry against intangible attacks. Description: The user will send 2 front kicks to the target, each kick dealing D-Tier damage. Material: Tamagahane, a rare steel used to create a super sharp katana. The Saya (sheat) is made of light wood. 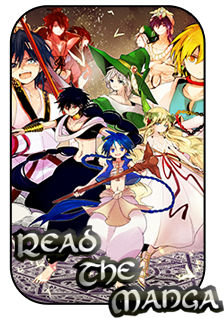 Appearance: The sword’s appearance is like a common Japanese sword, the sheath is black colored and it has a silk-cord around it. The sword’s handle is 13 cm in length and the blade itself being 60 cm in length, it makes the total size of the sword become 73 cm. The width of the katana itself is 2.77 cm at the hilt and 1.69 cm at the tip, the thickness of the katana is 0.65 cm. 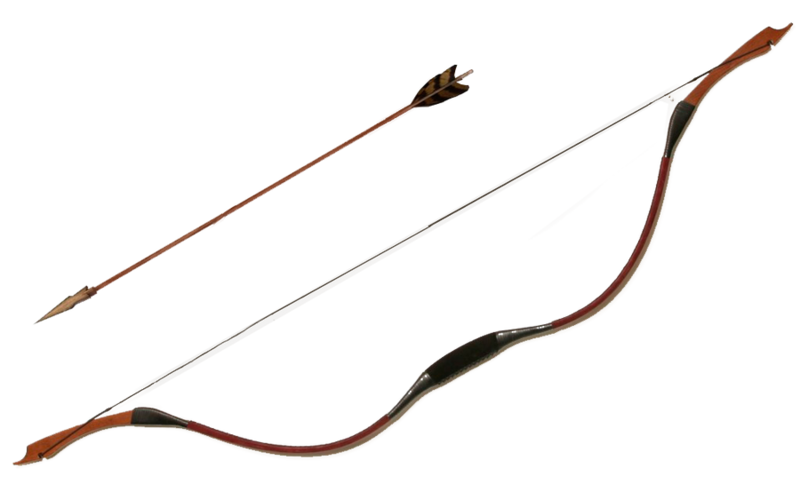 Appearance: It is a curved bow made from strong wood and laminated by red colored snakeskin. The bow is 200cm in total and the string is made from fiber, making the draw length of the bow itself to be 85 cm. Ammunition Appearance: The arrow itself is made from same material as the bow and it is 103cm long with 1cm width. The color of the vane and crest is red to match the color of the bow. The arrowhead is shaped in broadhead shaped, it is 5cm long and 3cm wide. The red haired girl raised an eyebrow when the man in front of her said her name was beautiful, not only that, he knew the meaning of her name as well and that made her somewhat happy. Tenma seemed to be a very observant person as well as he could tell that Altan was staring towards his Katana, simply admiring it. With a nod, the Fanalis answered to the man, “I do, I can tell you are taking a really good care of it.” Perhaps his love towards his Katana was the same with Altan’s love towards bow and arrow, although she just met him, she could feel a respect from herself and was proud that she could respect someone else this quick. She gave the man another nod when he said to protect each other’s back and prepared herself with her bow and arrows ready whenever she spot an enemy. However, she thought that it was pretty reckless for the man to just go outside like that as they never know what could happen. But when she kept up with the man, it seemed that he was doing okay in the middle of the chaos. His stance when he shot the arrow was perfect and he was also good at fighting as well! But she wanted to get some part in the show as well, so when she spotted one of the soldiers attempted to lunge his sword towards the one eyed man, Altan skillfully shot 2 arrows towards the soldier’s arm which was holding the sword and stopping him from hurting Tenma. Right after that, Altan quickly sustain her skill and shot another 2 arrows towards the soldier’s other arm. As if it was not enough, the Fanalis fed some magoi into her crystal bow and conjured 4 crystal shards before sending it flying towards the other soldier and sustained it to pierce the other soldier with another 4 crystal shards. There was one more soldier left in the area but she was wrong because suddenly another man appeared and judging from the armors, it seemed that he was a higher level soldier. The only soldier left charged towards Altan with his sword though, wanting to attack the Fanalis. With a quick respond, the redhead shot her arrow towards the sword after scaling it up to clash it and putting all power into her arm before sending a basic punch towards the soldier’s abdomen. 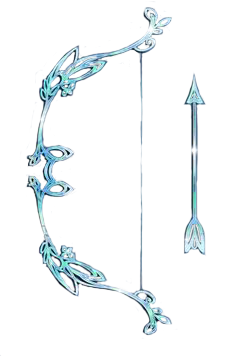 Altan would shot 2 arrows one by one towards her target who is 15 meters away from her, each arrow would normally deal D-tier damage unless the Scaling effect is used. Requirements/Drawbacks: Altan need to aim her arrow to the incoming attack, wouldn't work for intangible type of attack. Altan will shot the arrow to the incoming attack and redirect the attack so it won’t hit her. She could only redirect D-tier ability unless she use the scaling to increase her defensive skill durability. Appearance: A beautiful 1 meter bow with crystal decorating the body. The bowstring itself was made from fiber. The magic circle can be found on the bow’s handle. Crystal Rain - By feeding the magoi into this item, user could conjure four 50 centimeters crystal shards that could be controlled freely by the user. This shards could be used to attack the enemies within 5 meters radius from the user and inflict D-tier damage from each shards. 10 Magoi to activate | 5 Magoi to sustain. “Whoops.” The one eyed man smirked when some arrow struck the soldier’s arm, stopping the attack and gave Tenma time to step back. He knew he could count on the Fanalis girl and decided to just let her shine at the moment by doing a shooting spree towards the poor soldiers. As he watched how the girl’s fight, someone who seemed to be the leader appeared and Tenma thought it was his turn again now. So he gripped his shield with his other hand and with a more evil smirk carved on his lips, Tenma walked towards the officer as the latter did the same as well. His face was stern and angered, probably because of how easy his soldiers got defeated and the humiliation that he would get when he reported all of this incident to his supreme leader. However the officer might not be able to come back alive to report all of this though and the black haired man was kind enough to think about his wellbeing and would rather to just kill the man right here and right now to save his face from embarrassment as well as from a seppuku. Description: The user is able to redirect up to B-tier attack with their weapon, cannot parry against intangible attacks. Description: Tenma brings his Katana to deliver a downward cut from above and then instantly striking again in an upward motion from below. Each cut will deal C-tier damage if hits. Description: Tenma lifts his shield up and hides behind it to block against up to B-tier attack. Description: The user will deliver 4 surprise cuts to the target, each slash dealing D-Tier damage. Appearance: This shield is made of Onyx and is approximately 1 meter tall and .5 meters wide. The magic circle can be found near the handle of the shield. Molten Brace – Feeding magoi into the shield causes its face to glow red hot, the onyx turning into lava. The user is protected from any heat generated by this effect. Any ice A-tier or below covering the user or within 1m of the shield will be melted. 10 Magoi to activate | 5 Magoi to sustain. It happened so fast like the officer was not a match for the one eyed man, at all. Altan was surprised that the officer was not even able to fight more, like he was just being toyed by Tenma from the start. That was how strong the swordsman was and Altan was finally understand that she also had to be careful as well. Not only that, the moment when Tenma killed the officer, Altan was almost opposed to it like she didn’t agree with the killing but then again when she thought about it, killing him was the right thing to do because he might be death when he reported his failure to his leader anyways. No matter how wrong it sounds, mercy killing might be necessary at the moment like this. “Oh?” Tenma was amused once again, to think that the red haired girl understood his action made him chuckled. “Not many thinks like that, you really are a wise lady.” He beamed Altan with a bright smile before he helped the Fanalis to set things up back in order again after the attack made it all messy. Not only that, when he observed how the girl fought with her bow and arrow, Tenma thought it would be nice to have her train him some archery basics and skills. “Miss Altan, I would love to treat you to a friendly lunch after this and perhaps you can teach me some of your archery skills?” The one eyed man was very hopeful and he couldn’t hide the excitement on his expression while he asked the Fanalis.